A visit to the Black Madonna Shrine and Grottos in Eureka was chronicled in two pages in a scrapbook the Blanner family created of their visits to various churches and shrines. The family was participating in the pilgrimage challenge issued by the faith development committee of St. Margaret Mary Alacoque Parish. On the last day of the school year at St. Margaret Mary Alacoque School, Msgr. Norbert Ernst thanked the parents and graduates who joined the students at Mass. A photo the Blanner family included in their scrapbook of visits to pilgrimage sites was taken outside the Cathedral Basilica of Saint Louis. Shown in the back row are Mary and Jeffery Blanner with their older children, Katherine, Emma, Abigail and Jeffery. In the front row are Simon, John Paul, Aliza and Maria, all St. Margaret Mary Alacoque students. “Thank you Lord that my parents sent me to a Catholic school,” was a refrain the parish pastor repeated in a song he sang during the homily May 25. He spoke of the need for a firm foundation in Jesus and His teachings and for being His hands and heart to others. The parents at the school in south St. Louis County don’t simply send the students there for their religious instruction — they take a role, thanks in part to a faith development committee of the Home and School Association. One of the activities they developed was a pilgrimage challenge to encourage families to grow in their faith by exploring many of the churches, shrines and holy sites in the archdiocese. Each family was provided with a list of 13 suggested locations and asked to take family photos during their visits. “Our goal is to foster and encourage faith formation at home by providing resources and opportunities to families to develop a deeper understanding of the Catholic faith,” said Pete Holcomb, co-chair of the faith development committee. St. Louis has a rich Catholic history, so visiting the shrines and churches is “a great way for families to explore their faith together, have little outings and adventures to these sites,” Holcomb said. At the closing Mass, the Blanner family was recognized for visiting 10 of the 13 sites and for compiling a scrapbook of their visits. The Blanners have eight children, with the youngest four attending St. Margaret Mary Alacoque. Mary Blanner said she and her husband, Jeffery, visited pilgrimage sites during the Year of Mercy, 2015-16, and enjoyed it. This time, mom and dad Blanner’s favorite site was the Cathedral Basilica of Saint Louis, which is the parish they attend. Other family favorites included the Shrine of Our Lady of the Snows in Belleville and the Sisters of St. Joseph of Carondelet, where they were drawn to an interesting history involving the underground railroad and the presence of relics. Traveling to Mass at a destination makes the faith more important to the family, Mary Blanner said. “It’s not like just stopping in at Mass and then going to a game,” she said. Holcomb agreed, noting that “anytime we can show our kids the beauty of our faith is a great experience for us.” He’s planning on taking his family this summer to some of the sites they missed during the school year. His favorite site so far is the cathedral basilica. He talked to his children about its history, its mosaics and St. John Paul II’s visit there. The committee also had an initiative to introduce parents to perpetual adoration. 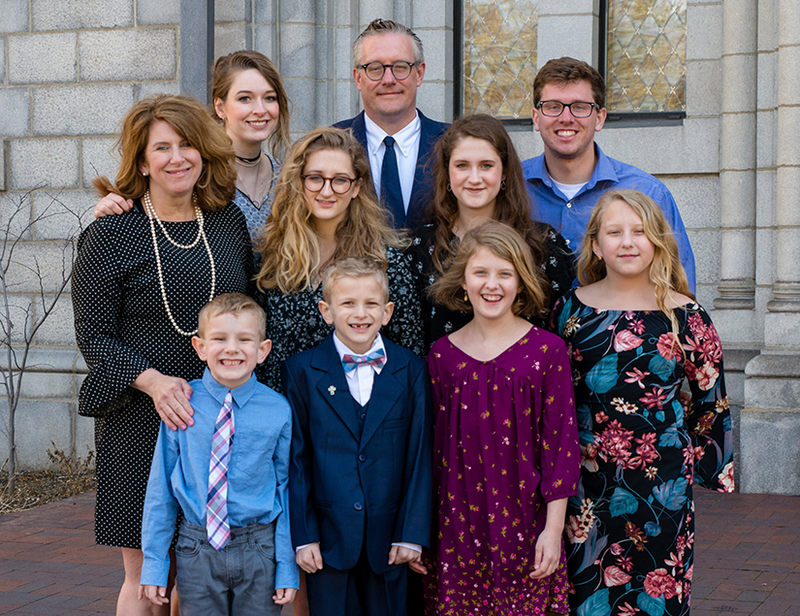 “As much as we can help families in this day and age, with their attention being pulled in different directions, to help them with their faith, that’s our goal,” Holcomb said.